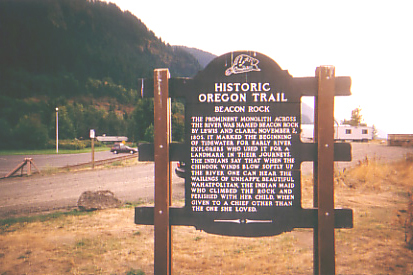 The prominent monolith across the river was named Beacon Rock by Lewis and Clark, November 2, 1805. It marked the beginning of tidewater for early river explorers who used it for a landmark in their journeys. The Indians say that when the Chinook Winds blow softly up the river one can hear the wailings of unhappy, beautiful Wahatpolitan, the Indian maid who climbed the rock and perished with her child, when given to a chief other than the one she loved.